Americans over-romanticize French cuisine. When in fact, there’s nothing special about it. Though it does have Italian influences, it’s no Italy where they make pizza and pasta fresh, or Spain – masters of paella. France produces grapes (for wine), brie cheese, and are experts at bread and fries (baguettes will never be the same for me). Today I got on a scale for the first time in five months. I was a little very sad about what I saw but let me tell you the results were NOT an effect of the food I cooked. They were a result of the food that I DIDN’T make and snacking. I have photos to prove that I have indeed been cooking healthy-ish. Now a little about my eating habits: I don’t like cheese and white bread is no good for my six-pack abs. And like the Nigerian I am, I LOVE food made with “spices and herbs to create deeply flavoured sauces and soups often made very hot with chili peppers.” If it’s spicy and/or crunchy, I love it already. When it came to cooking I figured I should “eat clean” so that I can indulge when I don’t cook. Below I highlight some of my favorite/ best dishes from each month. First attempt (abroad) at making Obe Ata which actually ended up being Ata Dindin (fried pepper stew). It was sooo delicious! I posted on Facebook asking how to make Obe without a blender and I was told to use tomato paste. Couldn’t even tell the difference. I made Obe one other time but the time it took to make it wasn’t worth. This was one of my favorites! tortellini avec legumes et saumon (tortellini stuffed with vegetables and salmon) Made this about two more times until I cut out white pasta haha. Very simple yet delicious meal: Couscous with shrimp and veggies. I ate a lot of salmon this semester but considering I don’t really eat red meat it was either salmon or chicken. This was when I started to get my diet in order. Salmon, kale and tomatoes salad with balsamic vinaigrette. Made this one other time the got tired of kale haha. On the rare occasion I woke up for breakfast: Oatmeal with strawberries and honey. You all KNOW I had to make Jollof one time! Sadly, I bought some weird type of rice and it never cooked all the way. But the flavoring was delish! It took entirely too long to make so I didn’t make it again. Then I started making salads. Spinach, olives, tomatoes, beets and sometimes chicken with balsamic vinaigrette. I really enjoyed the fresh farmer’s market, Noailles. It was about 30 minutes away from my residence that sells fresh produce, meat, and fish to candy and even cooking utensils. I can get a weeks worth of food for about 20€ which is great. It made grocery shopping more interesting for me. 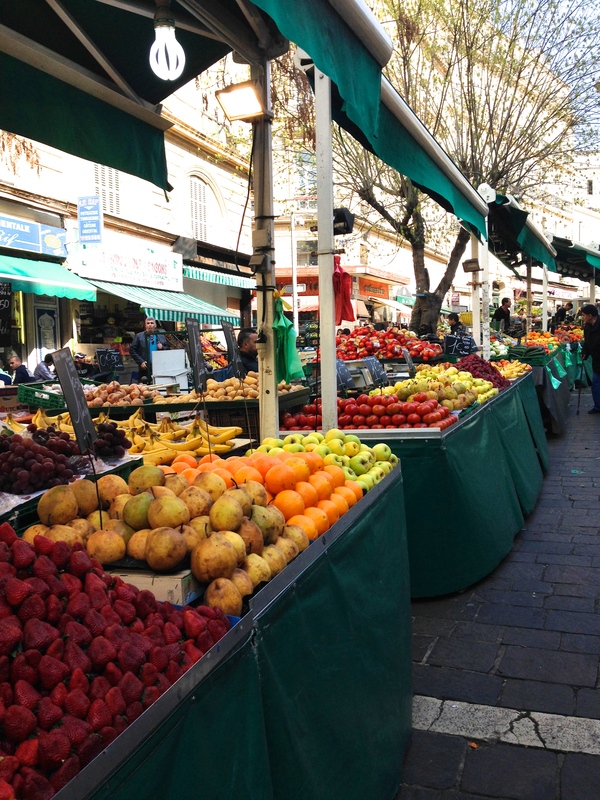 Fresh produce markets are all around Europe as well. There should be more in the US. The international aisle at the grocery store: peanut butter, cookies, popcorn and Aunt Jemima. ‘Merica. 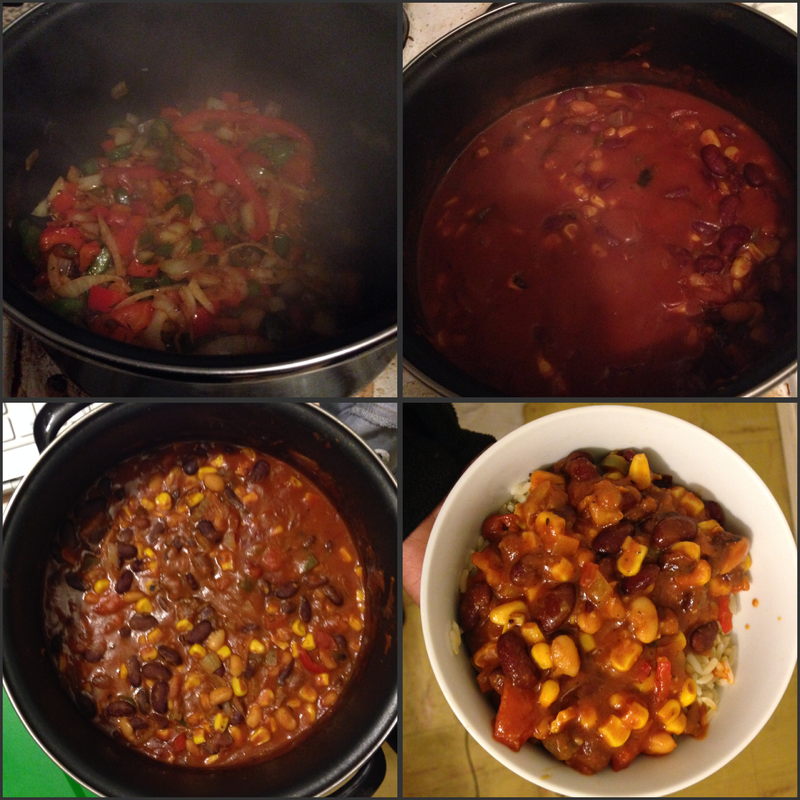 Vegetarian Chilli. I had two people taste and we agree that this is literally (one of) THE BEST dishes I made. For some reason, Marseille doesn’t have black beans so I just used red beans. I loosely followed this recipe I found on Youtube. Made it a second time and it tasted a little like adalu. I would have really liked to make it with ground turkey but I could not find that anywhere. Def going to make this once I get home and add black beans in there. The annoying thing about grocery shopping is that for whatever reason they never have the same selection on a week to week basis. Pictured above is chicken, salad and what I thought were sweet potatoes. They looked like sweet potatoes on the outside but on the side they were white and tasted like African yams. My first and only attempt at making Obe Efo (spinach stew). This failed for a few reasons. For one I added way too much tomatoe paste and not enough spinach. As always the seasoning was great. Whole Wheat Pasta with sautéed chicken and veggies. I don’t know why I didn’t make this more often, it was great and it’s healthy! Then I got more creative with “salad week”. Sweet potatoes and sautéed veggies (not sure if this counts as sauté cause I added LOADS to seasonings, kale, zucchini, and tomatoes. That veggie peeler changed the game! Once again, I know this doesn’t look appetizing (I didn’t intend on posting these photos) But trust and believe this tasted AMAZING! Got the recipe from FitMenCook YouTube. Made this twice and both times it lasted me about a week. It’s so tasty AND healthy. I will def be making this when I get back home. Second attempt at making “Chipotle.” The key really is in the cilantro and lime. Brother’s Green YouTube channel has all the secret ingredients. Tasted ALMOST just like Chipotle I just needed red salsa and black beans (for some reason France doesn’t have black beans). Another one that I will have to try to make at home. Before coming, I knew I could cook, but being here I learned how to COOK. Cooking every meal you eat (as opposed to having a university meal plan/ living at home) has been an experience. These last five months have definitely prepared me for “the real world”. Being in France, I learned to improvise on ingredients and experiment. I noticed that in France you pay to eat unhealthy food. As opposed to in the United States where it seems you pay to be healthy. For example, a McDonald’s meal in the United States is about $5; the same meal will cost you 10euros (which is about $14). I hope to keep this up this summer – this time sticking to the clean eating.